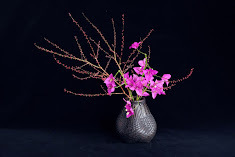 I decided to republish the following two of my short articles on Ikebana for two reasons. First, I am going to rewrite and extend the first article, Ikebana and Zen for a journal. I'll let you know the details here sometime soon. Second, I am disappointed to witness unkind behaviour of an Ikebana practitioner lately. This Ikebana teacher represents some Ikebana group but he does not seem to understand what Ikebana is for. What he did would not be accepted in Japan where Ikebana teachers are well respected not just for their skills but chiefly for their virtues. As far as I know, an Ikebana teacher could not survive in Japan if he or she is rude, unkind or ungenerous. There is social expectation for him/her, which could be social pressure or even sanction. Just imagine a role of a priest in a community in a country like Australia. There is something similar in the role of an Ikebana artist in Japan. Sometimes we have to be strong to be kind to others. Good Ikebana artists seem to know that flower can give power and courage to overcome their inner fears. Ikebana may have become popular overseas, but do they really understand that it is a way of personal development?